This chapter proposes a paradigm, which empowers practitioners to practice research to meet their needs and to advance the profession to which they belong. It proposes the integration of practitioner and researcher role as an alternative to the fragmented model that currently exists. In doing so, it draws much from the past tradition of the action researchers as well as the science approach espoused by others. In this way, the needs of individual managers to evaluate their espoused theories and their theories-in-use can be undertaken so that their organizations can function more realistically and can respond more effectively to the need for self-examination and change. Elfenbein, M., Brown, S. M., & Knight, K. H. (1998). 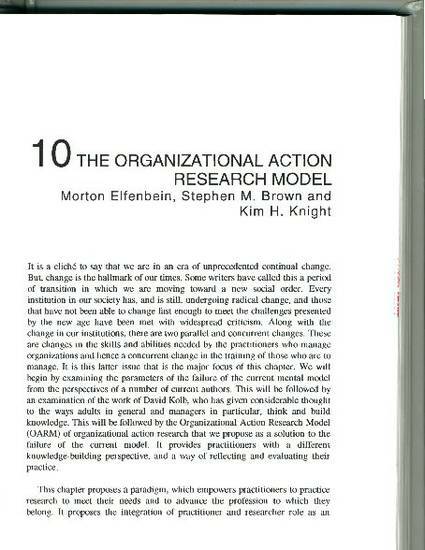 The organizational action research model. In Brown, S. M. & Seidner, C. J. (Eds. ), Evaluating corporate training: Models and issues (pp. 3-17). Boston: Kluwer Academic.